I'll skip over my previous observations regarding the swift recovery of abuse by similarly threatening means...(!) and jump into the narrative here. 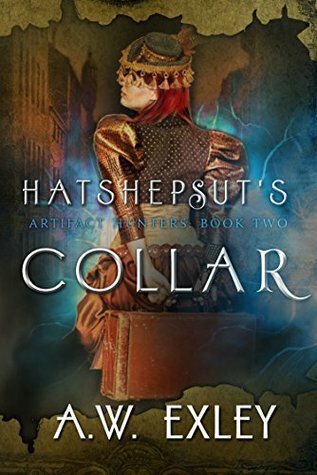 An Ancient Egyptian artefact called "Hatshepsut's Collar" is being worn by Queen Victoria, and its mystical power is driving her to extreme paranoia and warlike behaviour. Even her consort Prince Albert is concerned about her. In real life: Hatshepsut was one of the most important female Pharaohs of Ancient Egypt, and a prolific builder of monuments and buildings; and almost written out of history thanks to the jealousy of her son who eventually inherited her throne and set about destroying much of what she created. Cara and Nate are privately looking into acquiring and safe-keeping these types of artefacts in order to prevent their misuse. In the process, Nate gets himself accused of treason and is begin held captive in the Tower of London, awaiting his execution. Cara therefore leads a swashbuckling plan to break him out. Oh and somehow there are now Dragons in this universe! As this second novel focuses more on narrative plot vs personal relationships, I enjoyed it more than the first in the series. We also left the confines of England for a while to explore a little of the world in this steampunk/mystical vision of the Victorian era. Sign into Goodreads to see if any of your friends have read Hatshepsut's Collar.